There comes a time in the lifecycle of every IT asset when it must retire from service. Companies constantly replace outdated computers and countless electronic devices to keep up with technology and enhance worker productivity. IT asset disposition (ITAD) is the disposal of unwanted equipment in a safe and responsible manner. IT asset management (ITAM) is accountable for lifecycle management of assets across an organization including the process of ITAD. In a perfect world, ITAM should be able track 100% of assets from acquisition to disposition. However, we don’t live in a perfect world and it is unrealistic to expect 100% tracking of assets. 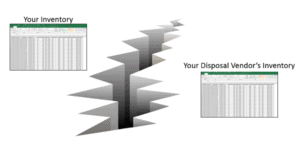 The inventory discrepancies discovered during disposal phase represent the ITAD Reporting Gap. From an ITAD perspective, there is a critical distinction between the retirement and the disposal of an asset. This distinction makes sense because there may be a significant time between the retirement (asset is no longer being used) and the physical disposal (asset is shipped to a disposal vendor). Of course, there is also a transfer of ownership. An unbroken chain-of-custody is necessary to protect your organization from risks associated with ITAD. The ITAD Reporting Gap represents missing links in the chain-of-custody and therefore increased exposure. The larger the gap, the greater the risk. ITAM’s responsibilities include the development policies, processes, and systems to manage the IT asset portfolio with respect to risk, cost, and compliance. Managing the ITAD Reporting Gap is an essential part of this responsibility. To shrink the ITAD Reporting Gap, organizations must adopt an effective policy and implement a proven process. ITAM must be given the required tools, resources, and support.